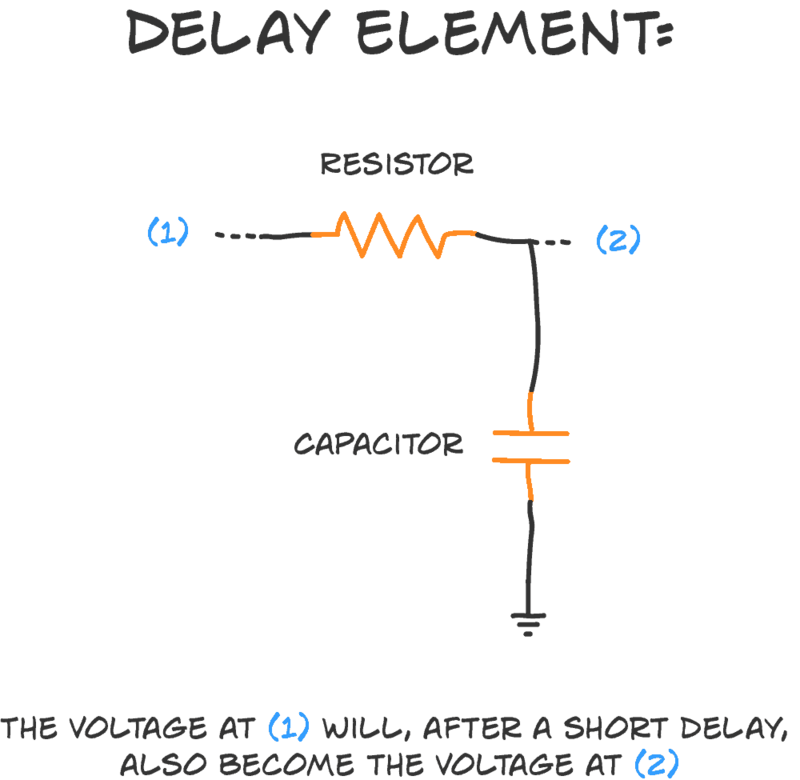 The RC delay element is a way to create a time delay in your circuit by connecting a resistor and a capacitor. It’s super simple. And very useful. A capacitor is kinda like a tiny little battery. You can charge it with a voltage. And you can use this voltage for a short time until the capacitor is discharged. The time it takes for the voltage to rise across the capacitor becomes our time delay. A capacitor with a higher Farad value can store more energy than one with a smaller value. Therefore it also takes more time to charge a high-value capacitor versus a small-value capacitor. The “speed of the charging” is determined by how much current that flows through the capacitor. The more current that flows, the faster it charges. If we connect the capacitor directly to the battery, there is no restriction on the amount of current that flows through the capacitor (other than the batteries own maximum current capacity). So a lot of current flows, the capacitor charges really quick, and the delay becomes very small. That’s where the resistor comes into play. The task of the resistor is to reduce the flow of current to the capacitor to slow down the time it takes to charge it. That’s the RC time constant, also called tau, which is written like τ. It gives you the time it takes for the voltage to rise from zero to approximately 63.2% of the voltage you apply. Put that into a calculator and you’ll get a time delay of 1 second. Hey Arturo, I hope you enjoyed it!